8 Space ATA Rack Case 8U Vertical DJ Rack Model #: SATAC8U | Heavy Duty 8 Space Rack Case. 3/8″ Plywood Construction | Smooth Black Laminate Finish | Hold standard 19″ Rack Mount PA/DJ Gear. External Dimensions: Height: 16 5/8″ | Width: 21″ – Depth: 28″. Internal Dimensions: Rail to Back with Rear Door On: 22″ | Rail to Rear Edge of Case with Door Off: 19″ | Front Rail to Rear Rail: 17 1/2″. Steel rack rails – Front and rear rack rails | Front and rear removable doors with foam padding. Standard 19″ Mounting Rail Width. Has dual 4″ steel link locks on both doors. Dual spring handles on each side. Weight: 41.6 lbs. Condition: New. 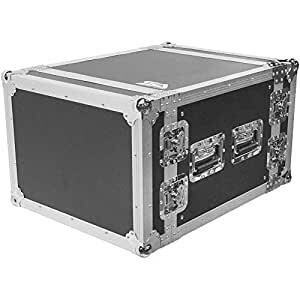 One year warrantySeismic Audio’s line of Heavy Duty ATA Rack Cases offer the perfect solution to ensure all of your Pro Audio and DJ Rack gear is protected and secure. These 8 Space Rack Case are made of 3/8″ Plywood and have a smooth laminated exterior. These racks are also versatile enough to be used as a server cabinet for networking. Keeps components secure with M6 Screws, Cage Nuts and Washers. These 8U Racks provide the best protection for your amplifiers, mixers, wireless microphones, snake cables, networking equipment, or anything that can be rack mounted! With your purchase, you will receive a one 8 space rack case pictured and described above. So, put it in your cart today and get ready for years of trouble-free, crystal clear sound!